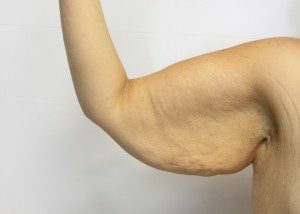 Excess skin and fat around the arms can be tough to correct without cosmetic surgery. A brachioplasty procedure performed by dual board-certified plastic surgeon Dr. Filiberto Rodriguez can help patients who reside in and around McAllen, Brownsville, the Rio Grande Valley, and all of South Texas. A brachioplasty, more commonly known as an arm lift, is a procedure that works to tighten lax skin on the upper arm. Women and men alike can develop loose skin around the arms, which can hang from the body when you extend your arms. This can cause you to feel self-conscious or uncomfortable in short-sleeved clothing. 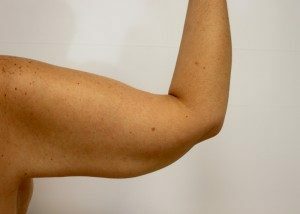 Arms that are flabby or sagging can be difficult to tighten at the gym! A brachioplasty can trim away the excess skin and tighten muscles in the arm as well. If there is any unwanted fat in the area, liposuction techniques can be used to slim them down. Dr. Rodriguez works closely to contour your arms in a way that is flattering to your body shape and appears natural and youthful. The following before-and-after pictures can help you better understand the potential results of a brachioplasty. It is important to remember that they will vary per patient. This 41 year-old woman from the Brownsville, Texas area presented to my plastic surgery clinic requesting an arm lift. She wished to remove the excess skin to better fit into her shirts following her successful weight loss. She is 5’9″ tall and weighed 216 pounds. We performed an extended full arm lift, and her results are shown 3 months post-op and she is thrilled with her cosmetic surgery results. This patient from the Harlingen, Texas area presented to my plastic surgery clinic requesting an arm lift. She wished to remove the excess skin that remained 1 year following her significant weight loss after her gastric sleeve surgery. We performed a full arm lift, and her results are shown 2 months post-op and she loves her new look after her cosmetic surgery. This 59 year-old woman from the Brownsville, Texas area presented to my plastic surgery clinic requesting an arm lift. She wished to remove the excess skin to better fit into her shirts following her successful weight loss. She is 5’4″ tall and weighed 196 pounds. We performed a full arm lift. Her results are shown only 2 months post-op and she is thrilled with her cosmetic surgery results. This 33-year-old woman from the McAllen, Texas area presented to my plastic surgery clinic requesting an arm lift after massive weight loss. She had undergone a laparoscopic gastric sleeve procedure 2 years before, and had lost over 200 pounds! She was 360 pounds and now weighed 158. Her weight had been stable for the past 6 months. She is 5’5”. Her primary concern was the excess skin and fat that remained around her abdomen, torso, and arms. We first performed a Fleur-de-Lys Abdominoplasty for this patient (See Tummy Tuck and Post-Bariatric photo galleries for more details). One month after her tummy tuck, we performed the extended arm lift as a staged procedure. For this patient, we extended the arm lift excision down the side of her chest to address her concerns from excess skin in this area as well, and performed a modified side body lift. Her post-op arm lift results are now shown 1 year post-op. She has healed beautifully and is very pleased by her scarring. She loves her cosmetic surgery results! This young lady from the Brownsville, Texas area presented to my plastic surgery clinic requesting an arm lift. She had lost over 50 pounds with diet and exercise over the past 12 months, and she was frustrated by the residual loose skin and stretch marks on her arms. We performed a full arm lift, and her results are shown 2 months post-op and she loves her new look after her cosmetic surgery. An arm lift is a specialized procedure that can help patients who reside in McAllen, Brownsville, the Rio Grande Valley, and all of South Texas enhance their body’s overall appearance. Contact us today to schedule your personalized consultation with dual board-certified plastic surgeon Dr. Filiberto Rodriguez at RGV Cosmetic Surgery and Vein Center.